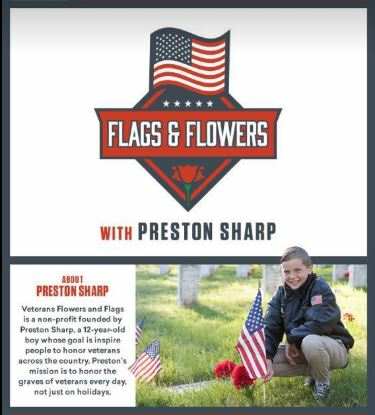 Preston Sharp is a 12-year-old student from Redding, California who has launched a call to action to honor those who have served through the simple, yet powerful, act of placing flags and flowers on the graves of veterans. Sharp begun his mission on Veterans Day 2015, when he visited the grave of his grandfather, a Navy veteran, and noticed the lack of American flags and flowers on the graves of other local veterans. Preston has set a goal of honoring veterans in all 50 states by Veterans Day 2019. Like WAA, Preston’s mission is to “honor veterans every day, not just on a holiday”! He wants to mobilize every person in the United States to take the time to honor a veteran to finding a way of acknowledging their service, such as taking them to lunch or completing the #FandFChallenge (posting photos of veteran graves after they placed flags and flowers). In recognition of his efforts, Preston was a guest of First Lady Melania Trump at The State of the Union in January 2019, as well as participated the launch of her “BE BEST” campaign. In June, Preston came to Texas, the 12th state that visited and where his God parents live. For Flag Day, they and the Austin community honored the 2,500 veteran graves at Texas State Cemetery (WAA location: TXATXC), with flags and red silk carnations. Since the cemetery didn’t have flags, Preston donated them for placement on Veterans Day and Memorial Day by like-minded groups, such as WAA-Austin, Texas Nomads-SAR, BSA Troop #25, DAR, SAR, and first responders. VF&F became a WAA fundraising group to assist covering the costs of the flags (as 9/11/18, $5,000 is still needed). Preston has placed at 2 other WAA-participating cemeteries: Camp Nelson National (KYCNNN) and Camp Logan (COFLND). Preston’s next state will be: New York (#22) at Cypress Hill National Cemetery in Brooklyn (WAA location: NYCHNB) on Saturday, Sept 29th at 10am. Please come and help him and/or invite your friends in the area.